The control template of RadProgressBar contains a number of elements needed for the correct functioning of the control. 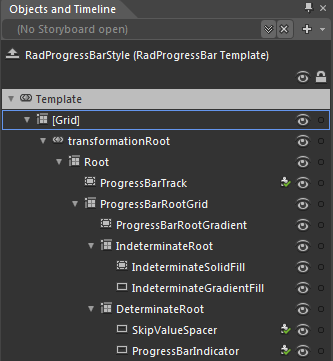 This section will explain the structure of the RadProgressBar's template. Here is a snapshot of the template generated in Expression Blend. transformationRoot - a LayoutTransformControl that hosts the RadProgressBar template elements. Root - this Grid element servers as the container wrapping all other elements in the control template. ProgressBarTrack - this Border element serves as the "empty" area of the ProgressBar which indicates the yet unfilled portion of the monitored operation. ProgressBarRootGrid - this Grid element is used for positioning the elements it contains. ProgressBarRootGradient - this element is used for styling purposes. IndeterminateRoot - this Grid element contains all elements needed for the default visualization of the indeterminate state of the control. IndeterminateSolidFill - this element is used for styling purposes. IndeterminateradientFill - this element is used for styling purposes. DeterminateRoot - this Grid element contains all elements needed for the default visualization of the determinate state of the control. SkipValueSpacer- this element is used when the SkipValue property is set. ProgressBarIndicator - this element is used for rendering the current progress(value) in the control.